In Sunday’s referendum, voters firmly rejected Europe’s plan to bail out the country’s economy. What’s next? On Sunday, Greek citizens took to the polls in a controversial referendum asking them whether they support a plan calling for continued economic austerity in exchange for debt relief. Their answer—with more than 70 percent of the votes counted—was a resounding “no.” The outcome means that next steps for the nation, which has fallen into arrears with the IMF and imposed capital controls to prevent a run on the banks, is largely uncertain. According to reports from Reuters, the country may next attempt to secure financing by asking for more emergency funding from the European Central Bank. The referendum—which had asked Greeks to vote “yes” or “no” on a proposal from Eurogroup leaders to extend financing to the deeply indebted country— was called for by Greek Prime Minister Alexis Tsipras amid meetings of euro zone leaders trying to come up with a deal to allow the country to avoid default. The call for the referendum effectively ended those discussions. Opponents of the most recent Eurogroup proposal felt that the austerity measures put forth by the group’s leaders—which would have included tax hikes, pension cuts, and reductions in government jobs—were overly harsh and punitive, and would hurt Greeks more than help them. The proposal also didn’t include sufficient provisions for writing down Greece’s debt—an omission that some critics, including Finance Minister Yanis Varoufakis, believed would leave the country in shambles for generations. Varoufakis said that he would “rather cut off [his] arm” than sign a deal that extends or intensifies the country’s debt. He had planned to quit if the country voted in favor of the deal. Those hoping for a “yes” vote contended that even painful economic terms accompanying a financing extension were better than no plan at all—especially if default eventually would mean leaving the euro. Tsipras had urged voters to say no to the current proposal, and also intimated that if Greeks had voted yes, he would have resigned. “If the Greek people want to have a humiliated prime minister, there are a lot of them out there. It won’t be me," he said on Tuesday. 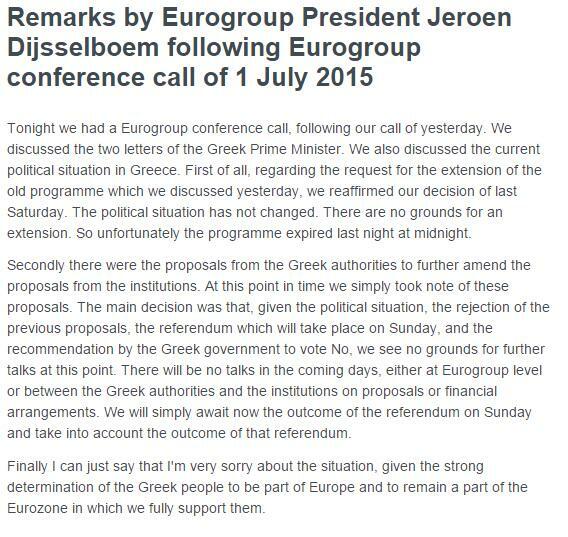 Eurogroup leaders made their distaste for the referendum clear. During the final hours before default (and directly after it), Sunday’s vote was cited as a hindrance to even considering new proposals from Greece, which could have staved off a default or pulled the country out of arrears quickly after the midnight deadline. On Wednesday, hours after the country defaulted in its debt to the IMF, it seemed that Tsipras was keen on making the deal work, as a leaked letter hinted that he was willing to concede to many of the economic conditions outlined in the Eurogroup’s plan. Then Tsipras appeared on television and said that the referendum would continue as planned. The back and forth added fuel to the fire for those who disagreed with the idea of a referendum and criticized Tsipras’s choices. On the eve of the default, groups of protestors demanding that Greeks support the proposal gathered in Athens. And in the days before the referendum, polls showed that Greeks were pretty evenly split when it came to how they’d vote. That the “no” side garnered over 60 percent of the vote, then, came as a surprise. A “no” vote means that Greece will remain in arrears to the IMF, and the question of what to do about the future of the financial system—specifically whether or not Greece will remain in the euro zone—will need to be sorted out among Greece’s leaders without help, or funding, from outside sources. The rejection of continued austerity also does not mean that Greece will automatically leave the euro zone—a scenario frequently referred to as a “Grexit.” As my colleague Kathy Gilsinan outlined earlier this week, there are many considerations that include staying in the euro zone, returning to the drachma, or some combination of the two. A “yes” vote, in any case, would not have solved Greece’s problems: The country’s debt is still massive at €271 billion, the economy is in shambles, and the unemployment rate is staggering at more than 25 percent. Nothing will fix any of this quickly. One thing is clear: Greece’s future is decidedly undecided. And while Sunday’s result won’t solve the many problems the country is facing, it at least revealed which difficult path the people of Greece have chosen to take.